Spot the Constellation Cetus: Sea Monster or Whale? 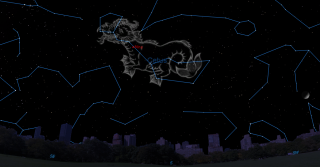 Cetus, the Whale (or Sea Monster) and the variable star Mira in the night sky Nov. 25 at 9 p.m. local time. In the southern part of the sky at around 9 p.m. this week, you'll find the large constellation Cetus. It's identified as either a whale or a sea monster, depending on what astronomy book or sky guide you consult. This constellation is often called the Whale, but in the allegorical pictures found in many of the old star atlases, the star formation appears very un-whale-like — almost like Godzilla with a fish tail! Nevertheless, today, the scientific name for the whale order is Cetacea, which is where Cetus gets its name. Cetus is also part of a collection of star patterns that comprise "The Celestial Sea." Capricornus, the Sea-Goat, leads the procession of those constellations across the skies of autumn. Next comes Aquarius, the Water Carrier, and below that we find Piscis Austrinus (the Southern Fish) and a long-necked bird that is usually found nesting in shallow water, a Crane known as Grus. Farther to the east are two fishes tied by their tails to a ribbon (Pisces). Below them, we find our dreaded Sea Monster (or Whale), and finally the Celestial River, Eridanus. Probably because the ancients knew very little about marine life, it is not surprising that they populated the deep with every manner of monster, including what we now would call mermaids. Take Capricornus for instance: a creature with the head of a goat and the tail of a fish, one of those odd land-sea animal-hybrids that the ancients tended to create. Cetus, which apparently dates back to the Mesopotamian period, was yet another example of such a monster. Although Cetus is not a particularly bright constellation, it is fairly simple to trace out, largely because it lies in a relatively star-poor region. Its brightest star is second-magnitude Diphda, also known as Deneb Kaitos, located in the beast's tail. The star that marks Cetus' head is Menkar, which is about half a magnitude dimmer than Diphda. But Cetus' main claim to fame is the star found in the lower part of the monster's neck: Mira, the Wonderful. This Latin name is from the book "Historiola Mirae Stellae" ("A Short History of the Wonderful Star") written by the 17th century German astronomer Johannes Hevelius. No doubt, the name Mira was also derived from the word "miraculous," meaning occurring through divine or supernatural intervention. And the word "miraculous" itself comes from the Medieval Latin, "miraculosus." The discovery of Mira as a variable star is often attributed to the German astronomer David Fabricius, said to have made the discovery in August 1596. But he only stumbled across Mira by accident; the star was then near its peak brightness, and he had not noticed the object before, nor did he find it recorded on any of his star maps. As the intruder faded gradually from view, it was logical to assume that it was a nova or "new star" like the one that astronomer Tycho Brahe had watched with amazement a quarter of a century before. But during the winter of 1638, the Dutch astronomer Johannes Holwarda watched this reddish star brighten and grow dim again. While Tycho's star never reappeared, this one apparently brightened and faded over a time span of roughly 11 months. It appears to rise to its greatest splendor twice as fast as it fades to obscurity. Mira usually ranges between magnitudes +3 and +9 (lower magnitudes are brighter), although it sometimes gets much brighter. (In 1779, its brightness was briefly a match for that of Aldebaran.) This large range in brightness is exceeded only by another Mira-type star, Chi Cygni, which can go from a very faint magnitude +13 or +14 up to +5 or even +4 in a typical cycle. Chi was the second long-period variable discovered after Mira, found in 1686 by yet another German, Gottfried Kirch. The star has a period of 409 days, give or take about 40 days. Currently, Mira is slowly increasing in brightness; it should reach maximum light sometime around Jan. 14, according to the 2018 Celestial Handbook of the Royal Astronomical Society of Canada. Keep track of the star in the coming days and weeks as it grows brighter. Seasoned observers routinely estimate Mira's brightness by comparing it to nearby stars. With nothing more than a pair of binoculars, you can also follow the light changes of hundreds of other stars. You might even be interested in joining the American Association of Variable Star Observers (AAVSO), still one of the leading organizations devoted to observing and recording such stars. People interested in getting involved or joining can check out the group's website or write to the organization at 49 Bay State Road, Cambridge, Massachusetts 02138. Leslie Peltier (1900-1980), whom the legendary astronomer Harlow Shapley once referred to as "the world's greatest amateur astronomer," wrote, "I feel it is my duty to warn others . . . that they [should] approach the observing of variable stars with the utmost caution. It is easy to become an addict, and as usual, the longer the indulgence is continued, the more difficult it becomes to make a clean break and go back to a normal life." To this end, one comes to realize that astronomy is almost unique as a science in that even in this high-tech era, the ordinary layperson, or amateur, can still make significant contributions. And variable star observing is one example of a worthwhile activity for the backyard enthusiast.